Need the highest-quality calendar file for printing? Are you publishing the calendar on a web site or in a newsletter? Do you need a calendar to share and group edit with colleagues? This page will help you decide on the right format for your needs. The PDF format was made for printing. 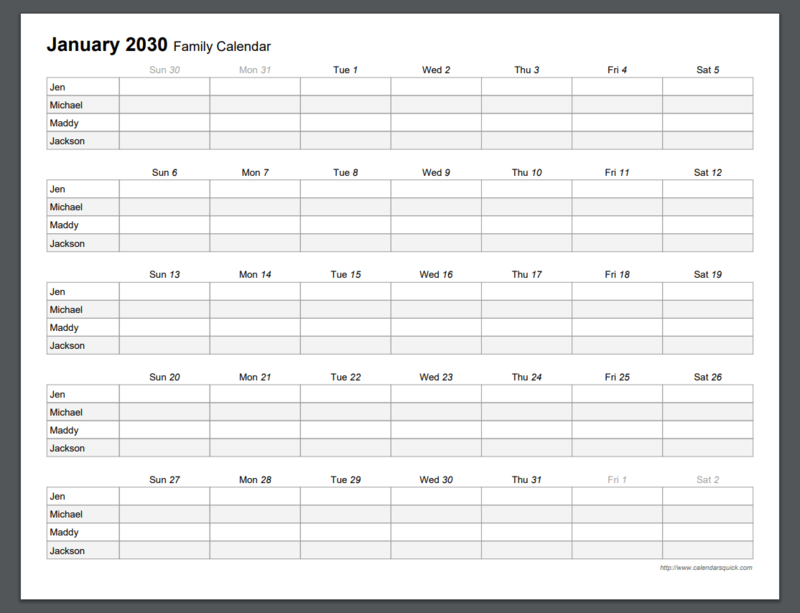 The way your PDF calendar looks on the screen is the way it will look printed (as long as your printer is set to a normal DPI setting). PDFs are commonly accepted by professional printers and some even accept PDFs online. PDF files are read-only, so you cannot edit them within Adobe Acrobat Reader. You can, however, specify how your PDFs will look before downloading them using your CalendarsQuick web calendar and account settings as detailed in the previous section. To view and print your PDF calendars, you'll need the free Acrobat® Reader® software. If Adobe Reader is not already installed on your computer, you can obtain it from the Adobe web site. All of the calendars on CalendarsQuick are downloadable in PDF format except for the 12-Month Photo calendar which is Excel-only. A number of templates also offer Microsoft Excel format and these are denoted by the PDF + EXCEL icon on the template category pages. If you have a lot of events entered in a schedule you are printing from a PDF download, it is recommended you use the actual Adobe Acrobat Reader software for viewing your file before printing. When there are many events, some can get clipped because they can't all fit in the space. 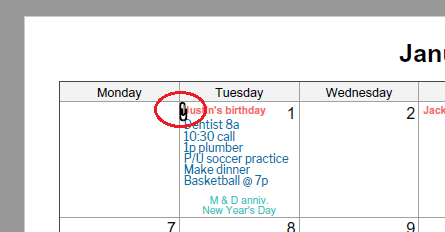 When this happens, CalendarsQuick will insert an annotation at that spot which shows as a paperclip. You can hover over the paperclip to view all events for that slot. Adobe Reader will display the annotation correctly, but using a browser's built-in PDF viewer may not. To fit all of the events in, you can lower the middle font size and try the download again. There is not a similar safeguard for the Excel downloads, so you have to be careful if including a schedule with lots of events. Usually if you see an event cut off, you can decrease the font size for that cell, or make that row taller and another one smaller to compensate. 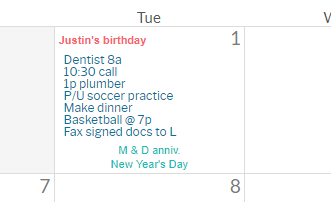 Excel calendars are great for direct editing, customizing, group editing, and sharing with others. They also look good printed. You can insert pictures into the boxes, change font colors for individual events, change the background color of boxes for certain dates, and so on. 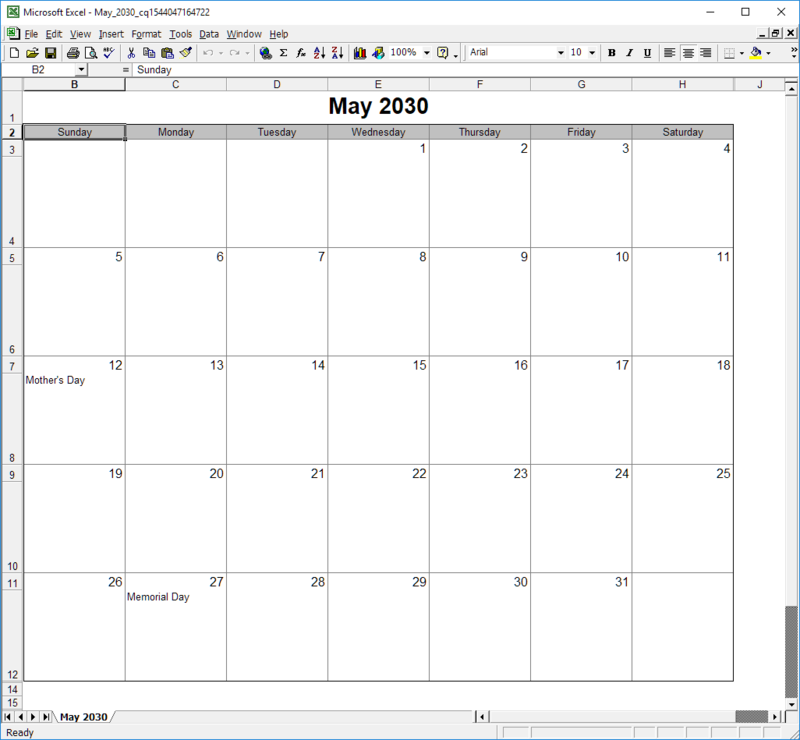 To use the Excel calendars, you will need Microsoft's Excel spreadsheet software, available from www.microsoft.com. Some of the Excel templates will let you download multiple calendars in one file, where each month or year is contained in it's own worksheet. For example, when you select full year for "Months to download" in the download form, your Excel file will contain calendars for all 12 months of the year. To print all months at once, go to Print > Select "Entire workbook". To break a line, press Alt-Enter at the end of each line of text. To insert a picture, first select your square, then select Insert->Picture->From File. Find your picture, then drag and resize to fit your square. To learn how to include events in the calendars you download, click to the next section: Printing your schedules. 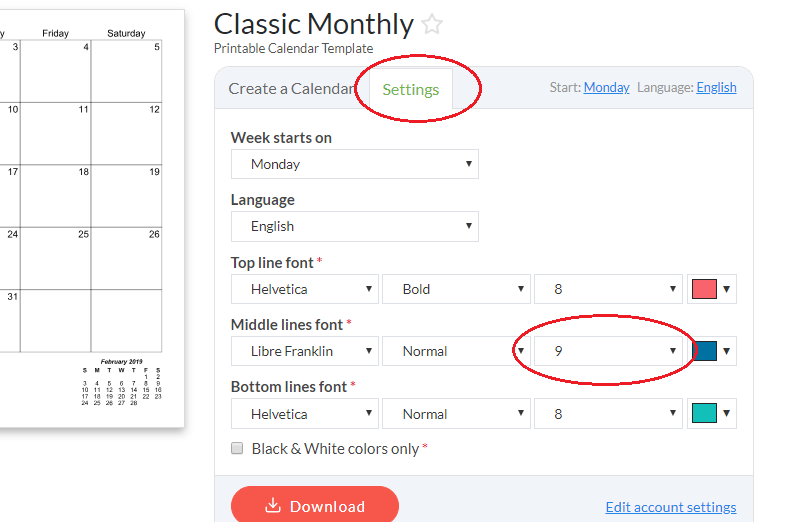 A compiled listing of the paper size options that are available for each calendar template can be found on the Paper Sizes page.